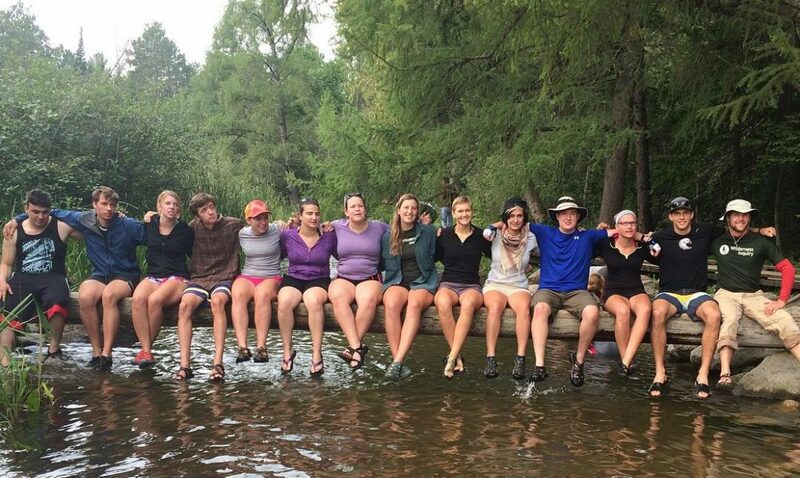 Students in the Augsburg River Semester Program at the Headwaters of the Mississippi River, Lake Itasca, South Clearwater, MN. Image courtesy of river_semester Instagram. What happens when you leave the confines of the classroom, step away from the whiteboards, data projectors, and PowerPoints, and move into the richness of the world itself? 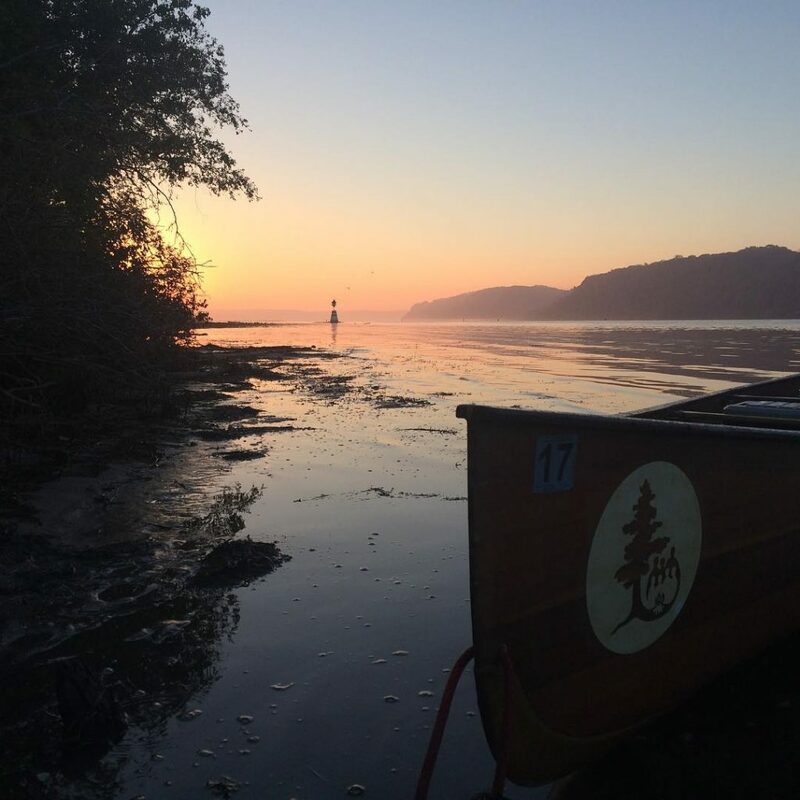 In August 2015, a group 17 students, staff, and faculty from Augsburg College loaded four 24-foot voyageur canoes with their gear and started paddling down the Mississippi River as part of the first River Semester. 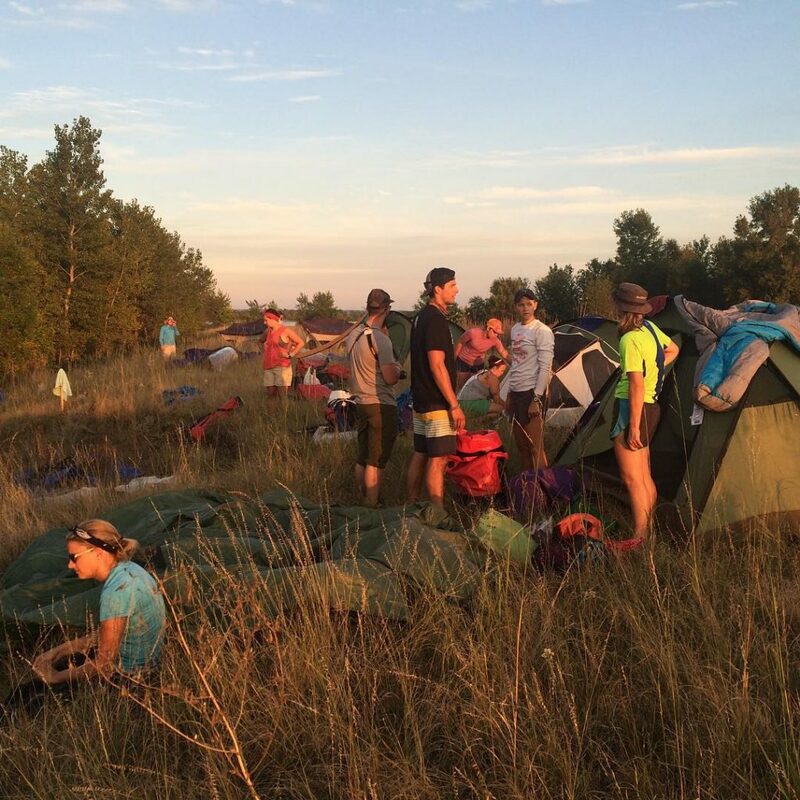 Over the next 110 days they traveled 3,600 miles, 675 of those by canoe, camping out most of those nights while completing a full complement of 16 credits in a wide range of course topics. The lessons learned from the river were reflected in the journal entries and reflective writing of the students. 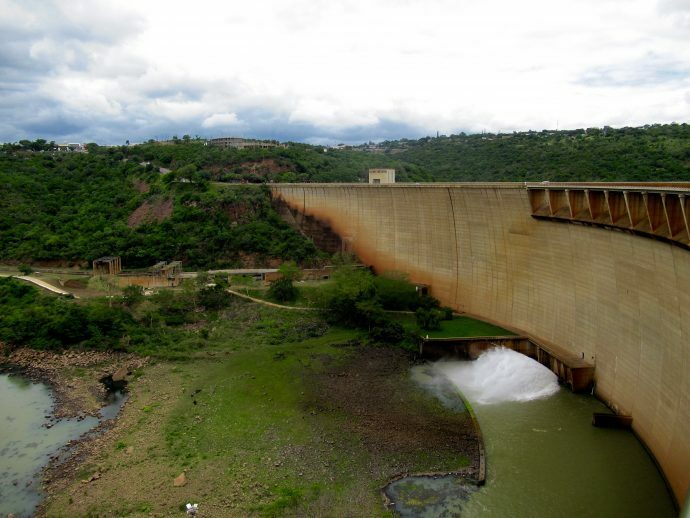 These covered a range of themes: a sense of adventure and exploration, an appreciation for the river, and an increased sense of agency in relation to the environmental issues on the river. The basic structure of the college classroom and curriculum entails a controlled space, a set curriculum drawn from a specific academic discipline, an authority structure based on the doctorate, and students seated in rows, taking notes. The learning there about the “real world” is filtered through the lens of the professor’s lectures, the scholarly texts, and the demands of intellectual rigor and preparation for the workplace. This is a setting and process increasingly complicated by sophisticated technology, increasing regulations and guidelines, and more outside demands on higher education. Sunrise over the Mississippi River at Pool 10. Image courtesy of river_semester Instagram. In that setting the faculty are no longer the main authority. Instead it is the river that has the final say. Faculty in this setting become guides, facilitators, partners, mentors, and co-learners of all that the river has to teach. As one student on the program put it, “It feels good to say ‘I know the Mississippi.’ But of course you don’t—what you know better is yourself and the Mississippi has helped.” Here the traditional role of the instructor was reversed; the river was the instructor, and we were learning from it. The subject of knowledge was also expanded from learning about the ostensible subject of the course to learning about one’s self. This is the kind of richness and rethinking that these kinds of immersive experiences can provide. Setting up camp at Pool 5 Weaver Bottoms. Image courtesy of river_semester Instagram. Looking at the stars or a campfire, listening to my guitar, and talking about ourselves, the world and our place in it, fostered by the lessons taught in our classes is certainly a powerful listening experience. We talked about the problems the river and ourselves face, and how we could solve them, and we became a family in the process. Emotional development and well-being are an aspect of this journey that can be overlooked, but we were learning who we are on those beaches and campsites. I believe self-discovery is an important part of listening as well. 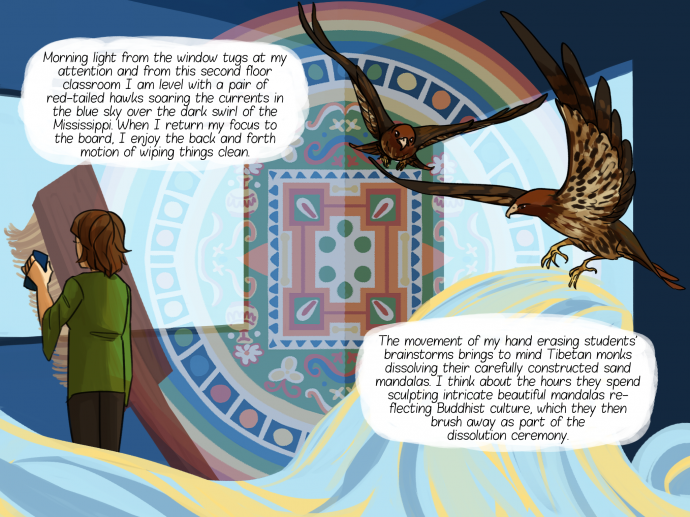 The passage reflects the student’s sense of awakening to the challenges and responsibilities of adulthood, the sense of connection to each other as a family, self-awareness, and at the same time a sense of worldly competence gained in a community of peers. Video courtesy of Ricky Taylor. 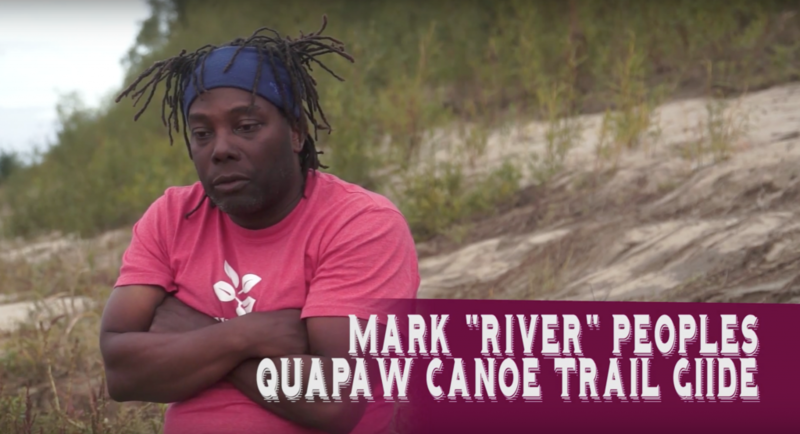 Mark “River” Peoples Quapaw Canoe Trail Guide during his time as a guide for the Augsburg River Semester. Image courtesy of Ricky Taylor. 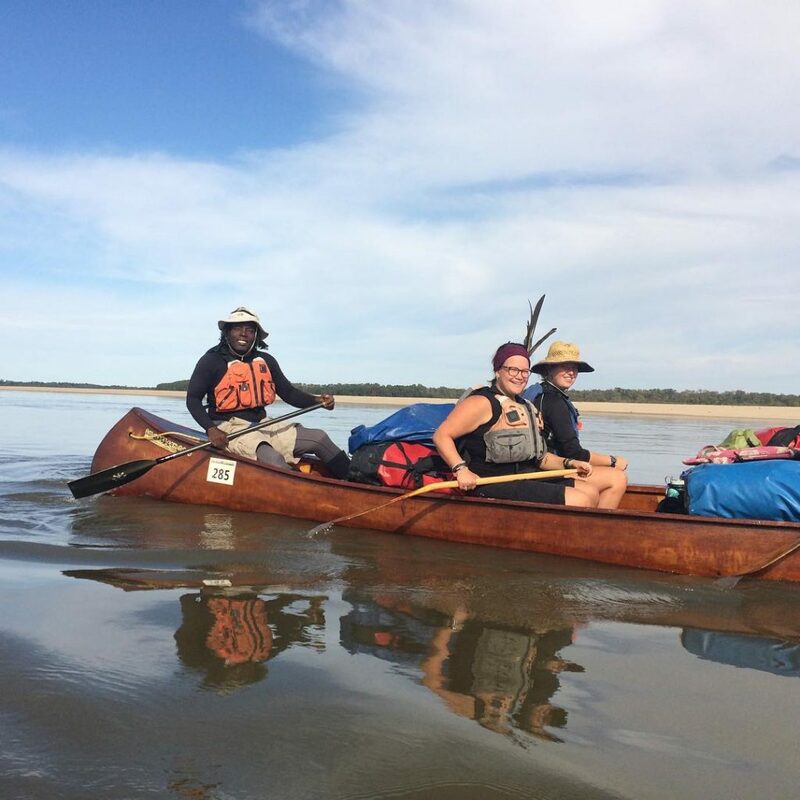 Paddling on the Mississippi River to Choctow Island. Image courtesy of river_semester Instagram. Perhaps the most salient connection expressed was, not surprisingly, to the river itself. As one student put it, “The river has stolen my head, my heart, my soul. Mud runs through my veins and my heart is filled with boils and eddies. The current pulls my feet downriver. I have become the river and the river has become a part of me.” Another wrote that, “If I had to describe the river with one word before the trip I probably would have said ‘dirty,’ now I would call it, ‘beautiful,’ ‘bountiful,’ or ‘a dancer.’” This conception of the river stands in sharp contrast to the mainstream view of it as a highly polluted and industrialized space. Another student, reflecting a new sense of the spiritual significance of the river to them, wrote, “The Mississippi River has always been the life force of America, supplying drinking water and goods across the nation. 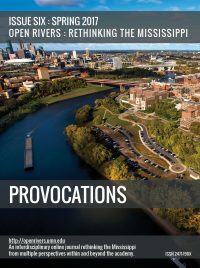 Maybe someday, America can move past the idea that the Mississippi River is just a river and see the river as a living goddess, or Pachamama, because that is what the Mississippi River is to me now.” This kind of deep connection to something like the Mississippi is arguably the first step toward taking action to protect it. Although there is clearly value to traditional syllabus-based, classroom-based teaching, and to the traditional wilderness and adventure-based forms of outdoor education, the responses of students to the River Semester indicate that there is great value in this extensive, hybrid, democratic form of experiential learning in a setting where wilderness and modern industrial areas were both salient features of the landscape. The river taught us about ourselves, taught us to care about the world, instilled a sense of wonder and agency, taught us to pay attention and listen, and prepared those students for meaningful lives of bringing their knowledge to bear in service to the world. These are powerful lessons, indeed. Boyte, Harry, ed. 2015. Democracy’s College: Public Work, Citizenship, & the Future of Colleges and Universities. Nashville, TN: Vanderbilt University Press. Breunig, Mary. 2005. 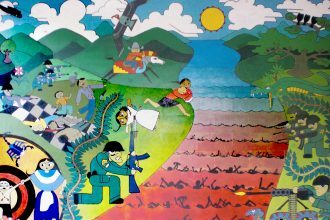 “Turning Experiential Education and Critical Pedagogy Theory into Praxis.” Journal of Experiential Education 28(2): 106-122. Dewey, John. 1938. Experience and Education. New York, NY: Kappa Delta Pi. Farrell, James. 2010. The Nature of College: How a New Understanding of Campus Life Can Change the World. Minneapolis, MN: Milkweed Press. Freire, Paolo. 2000. Pedagogy of the Oppressed. 30th Anniversary Ed. New York, NY: Bloomsbury Academic Press. Gruenewald, David. A. 2008. “The Best of Both Worlds: a Critical Pedagogy of Place.” Environmental Education Research 14(3): 308-324. Kolb, David A. 1984. Experiential learning: Experience as the source of learning and development. Englewood Cliffs, NJ: Prentice-Hall. Louv, Richard. 2008. Last Child in the Woods: Saving our Children from Nature-deficit Disorder. Chapel Hill, NC: Algonquin Books. Orr, David. 2004. Earth in Mind: on Education, Environment, and the Human Prospect. Washington, D.C.: Island Press. Shellman, Amy. 2014. “Empowerment and Experiential Education: A State of Knowledge Paper.” Journal of Experiential Education 37(1): 18-30. Wattchow, Brian & Mike Brown. 2011. 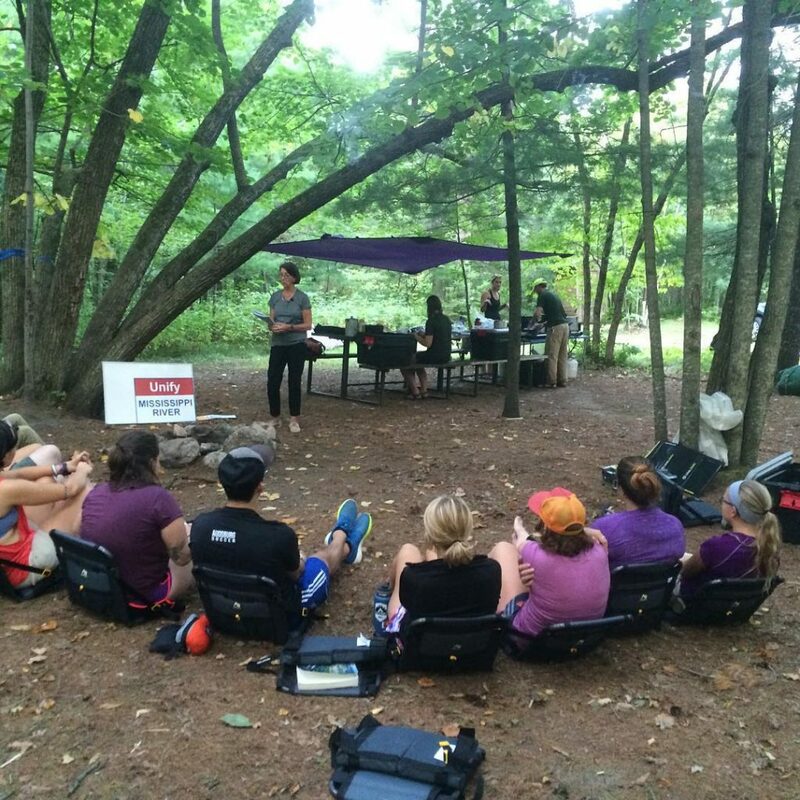 A Pedagogy of Place: Outdoor Education for a Changing World. Melbourne, Australia: Monash University Publishing. Download PDF of What we Learned from the River by Joseph Underhill. 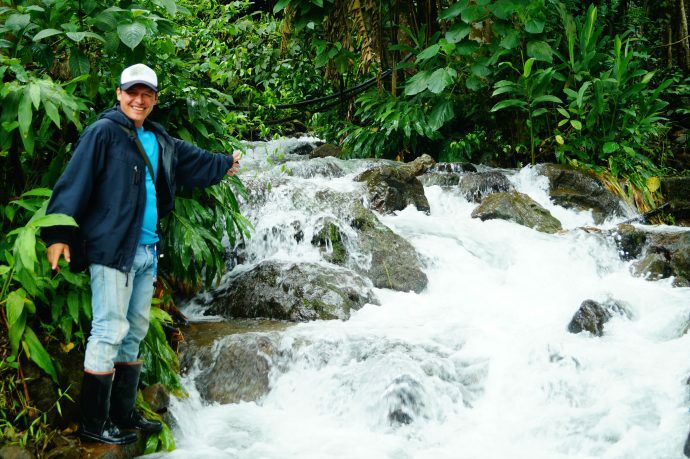 Joe Underhill is an associate professor of political science at Augsburg College in Minneapolis, MN, where he serves as Program Director of the Nobel Peace Prize Forum, Environmental Studies, International Relations, and River Semester programs. He is the author of Death and the Statesman (Palgrave 2001) and his current research and writing explore democratic practice and sustainability in higher education. The next River Semester will launch in August 2018. Where the Water Takes You: Unlocking Place-based Meanings through Inquiry at the Tidal Basin in Washington, D.C. The 2013 Hispanic Issues On Line volume, Troubled Waters: Rivers in Latin American Imagination, is a collection of essays that underscores an intellectual turn in Hispanic and Lusophone Studies toward the environment, and more specifically, the material, metaphysical, and literary “nature” emblematic of rivers that flow south of the Río Grande.